Each one is a product of the time and experiences they are going through. A young lady I know is heart-broken that she is unable to inspire someone who is terminally bed-ridden to see the abundance around him. She feels he is refusing to see the value in being happy, especially when the physical aspect of his circumstances are irreparable. “How do you get across to people who you know need positivity and inspiration but are not inclined to receive them,” she asked me. The simplest answer to this question is this: to each one their own; when it is their time to awaken, they eventually will. So, it is perfectly normal for someone not wanting to see the abundance around them, or see the value in being happy, and instead choosing to be steeped in scarcity thinking and depression. Sometimes, you have to accept this reality even with your own child, parent, sibling, spouse or companion. Such is Life. Not everyone is going to see Life through the same prism as you are seeing it. We must realize that each individual’s story, personal journey, is unique. And each one is a product of the time and experiences they go through. While someone may emerge stronger, wiser and happier from a catharsis, others may plunge into despondency and hopelessness. They may, when they realize the futility of their grief, eventually claw out of their crab holes or they may continue to wallow in self-doubt, self-pity, anger, sorrow, guilt and depression. When you try to inspire such people, remember always that motivation is an inside job – I repeat – so, to each one their own. You too must have come out of your depressive spiral only because you awakened from within. Yes, external stimuli – perspectives, events, people, whatever – helped, but you awakened only because you wanted to. Similarly, when you try to inspire someone, remember, they will awaken only when it is their time to awaken and only when they want to awaken. Those who have learnt the art of intelligent living – of serving, loving and being happy – are often impatient. Understandably. They have realized that all Life is ephemeral, that it is all Maya, an illusion, which will soon dissolve, evaporate, disappear with time. So, they can’t quite understand why other people try to complicate their lives – and those of others around them – so much. They wonder: why can’t people appreciate that being happy and being human alone matters? Such hunger to change the world is great but messiahship is avoidable. When you start perceiving of yourself as a messiah, you put yourself on a pedestal and insist that you have the powers to influence everyone. This is not true at all. You can only inspire others to action; to be inspired and to act on what their inner voice is goading them to do is entirely up to them. So, be a shepherd instead of wanting to be a messiah. A shepherd never tires of taking the flock to graze irrespective of whether they really graze each time or not! 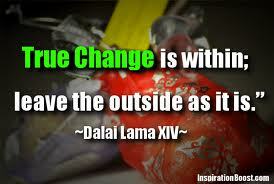 Which is why, when you are leading change in any context or environment, first be the change. And live that change no matter how harsh the circumstances are or how many people believe in what you have to share. This is the only way for you to protect your inner peace and be happy. Conversely, if you are not happy with who you are and what you are doing, you can never be the change that you want to see in the world.